Home | Cross-Canada Solidarity News and Events | CUBA SOLIDARITY EVENTS CALENDAR! (( 2 )) MARCH 9 – International Women’s Day: Celebrate the Revolutionary Women of Cuba & Venezuela! 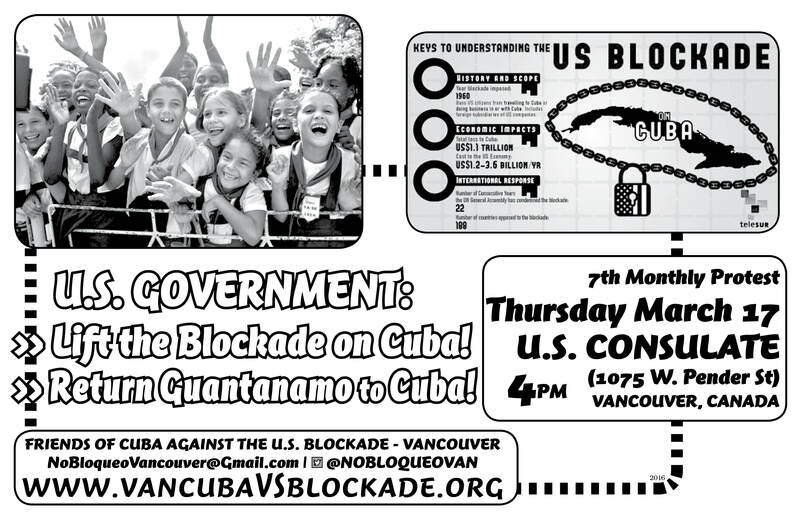 (( 4 )) MARCH 17 – Monthly Picket Action Against the U.S. Blockade on Cuba! Vancouver Communities in Solidarity with Cuba (VCSC) invites you to a Cuba solidarity photographic exhibit and conference organized in Seattle, Washington! VCSC is organizing a carpool if you are able to join for this unique and engaging event, call 778-882-5223 for more information. "Imagining New Paths for U.S.-CUBA RELATIONS"
Event Sponsors: Seattle Cuba Friendship Committee, US Women and Cuba Collaboration, National Lawyers Guild, Vancouver Communities in Solidarity with Cuba, LELO, and the following Seattle University departments- Latin American Studies, Global African Studies, School of Law Center for Global Justice, Women and Gender Studies, and Center for the Study of Justice in Society. Centre for Socialist Education, 706 Clark Dr. It has now been over one-year since Cuba and the United States announced the re-establishing of diplomatic relations. In this time there have been a number of steps towards the “normalizing” of relations between the U.S. and Cuba, however today, this relationship remains far from “normal.” The cruelest and most damaging aspects of the U.S. blockade on Cuba are still in place, including trade and financial restrictions that U.S. President Obama has the ability to reverse. The United States also maintains the illegal occupation of Guantánamo Bay. Vancouver Communities in Solidarity with Cuba (VCSC) invites you to join us for an info night and fundraiser for the 24th annual Ernesto Che Guevara Volunteer Work Brigade to Cuba! The evening will feature videos, photos, poems and stories from past Brigadistas, as well as a chance to win some fantastic Cuban prizes in a raffle draw and help to raise money for people joining the Brigade this year! This unique trip is not to be missed! For two full weeks in Cuba, from April 28th – May 11th, 2016 the volunteer work brigade combines volunteer work with cultural, social, economic and political encounters visiting different cities across the island. As well, the Brigade will participate in Havana’s powerful May Day parade! Since 1993, the Ernesto Che Guevara Volunteer Work Brigade has enabled hundreds of people living across Canada, of various ages, skills and backgrounds to travel and volunteer in Cuba, don’t miss your chance this year!